With the news of the Walt Disney Company buying up Lucasfilm and announcing a brand new Star Wars trilogy it would appear that as Obi-Wan Kenobi told Luke Skywalker at the end of the original Star Wars, and in turn us the audience, ‘the force will be with you…always’. How right the old bearded fella was. You’ve got to feel at least a little bit sorry for all those folk who have only just shelled out for Star Wars (yet again) when it was released on bluray. You’d almost be forgiven for thinking that someone was playing some serious Jedi mind tricks when the news was first unleashed. It was more a case of what Disney? rather than Walt Disney when it was announced last night of the sale of Lucasfilm to the house of mouse for 4.5 billion dollars. That’s more than enough money to fill a sarlacc pit. And that’s not all, laugh it up fuzzball, as Disney then went on to announce that it was slating a new Star Wars for 2015 release, followed by two more after that with Lucas on board as Creative Consultant. As Darth Vader might say: whhhhhhaaaaat!!! Unsurprisingly, that news sent much of the internet and social media into something of a spin and attracted more postings and comments quicker than a death star with its tractor beam on full power. So, was the move by Lucas and Disney right? Certainly, if the stock exchange were open I’d love to see the impact on the Disney share price. They have amassed quite an Empire now, if you’ll pardon the pun, with Marvel, the classic Disney back catalogue, Pixar, and not forgetting The Muppets, all now part of their ranks. It’s all a far cry from the late 70s when everyone was attempting to jump onto the Star Wars band wagon, Disney itself adding The Black Hole into the mix, which did just that in terms of box office takings, disappeared into a black hole. 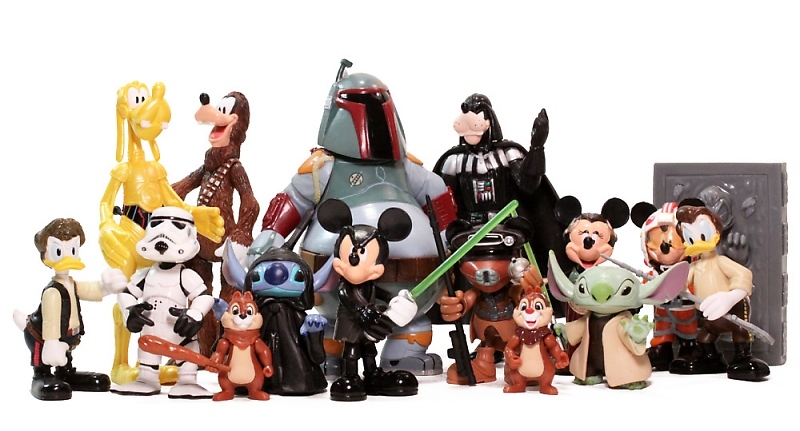 Other similar sci-fi and fantasy fare from Disney, such as Dragonslayer, Tron and even the animated The Black Cauldron – all with Star Wars undertones in one way or another – all tanked. Certainly its offerings under the Marvel banner, such as The Avengers, have all struck CP30 coloured gold, as did The Muppets reboot, a franchise harking from the late 70s that had also lost its way. But then we come to Disney’s John Carter from earlier this year. In theme and feel it was very much pitched as a Star Wars adventure for a new generation. The till receipts suggested otherwise and it was last seen heading not to Mars but straight into the mouth of that very same Disney black hole. Disney might have a slippery Hoth glacier to climb with fans expectations, but Lucas himself has left the franchise in something of a state and to be fair the quality control rot had been there since…well, a long time ago. You only have to look as far as the Star Wars Holiday Special, The Battle for Endor and Caravan of Courage and of course multiple elements from the prequels, which, rather fittingly, were a bit like the Emperor’s New Clothes as Lucas couldn’t see the woods – or should that be words – for the trees. That was the past, so what of the future? Mark Hamill and Anthony Daniels must be sat somewhere waiting for their phones to ring, and who can blame them. In some way shape or form it would be nice if there was a passing of the baton, or should that be lightsaber, from elements of the old cast to the new one. Perhaps even David Prowse might see a way back of sorts, after he and Lucas had a major falling out. It may all be set a long time ago but the reality is that 2015 is not far, far away which suggests that the studio is already some way down the Episode 7 road. Perhaps it will be direct continuation based on the critically and commercially well-received Timothy Zahn novels with followed the Star Wars children as it were. Who knows, Harrison Ford may even get his wish and have Han Solo killed off, just as he wanted in Return. The purchase of Lucasfilm also raises a multitude of exciting questions and possibilities. What does this mean for the much mooted Star Wars TV series? Does this purchase also include LucasArts and could that mean a Monkey Island film in the not too distant future? For that matter, with Marvel and Lucasfilm under one mouse eared roof could a Howard the Duck reboot be on the cards. I’m not saying it should, just asking. The Henson and Lucas link could of course mean a belated Labyrinth sequel could be a possibility. It has been a long time since the original but look at Tron Legacy and The Dark Crystal follow up is already in the works. Does the Lucasfilm sale have any impact on that other Lucas series, Indiana Jones? The possibilities for related rides etc will be endless at the already well established global Disney parks. It could even be something that emulates the success of the Harry Potter Tour. One other thing, will filming, like it did for the original trilogy, return to the UK? We won’t even mention Jar Jar. Disney might now well be running the bucket of bolts that is star wars but you can be sure, despite the clunky prequels, that this first new film will be no goofy movie (that was Phantom) and that this new trilogy will make the jump to box office lightspeed on, surely, May 4th 2015. Even if it will be without that Alfred Newman 20th Century Fox fanfare, something which has become as synonymous with the franchise as that word crawl, but then moving studios hasn’t done Bond any harm.